Use these Web-based programs from Clean Sweep U.S.A. Kids love to see things grow. Teach children how important it is to remain environmentally friendly in the garden by helping your child make a summer teepee out of vines. Children will appreciate watering their plants and watching the vines climb up the sticks. And they'll love their secret hiding place in the garden. Step by step instructions. Environmental Outdoor Learning Centers at schools provide students a dynamic opportunity to learn about their impact on the environment while working together with their teachers and the community. Build a foundation of respect for the earth by developing an outdoor learning center for your school. These centers give students an increased sense of pride and identification with their school and the environment. They offer teachers a chance to address all types of curricula while teaching students ecological cycles and how nature’s systems are interconnected. Learn how to provide children new motivation in attending school. View our guide for creating environmental outdoor learning centers. 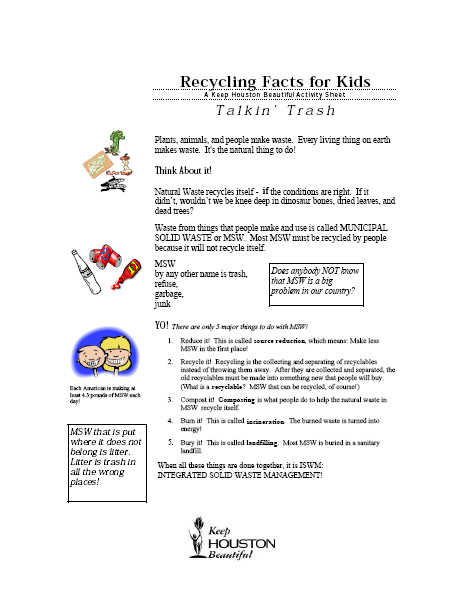 Keep Houston Beautiful puts to use its many years of developing and bringing litter awareness educational activities into schools and before youth groups. For over 30 years we have been instructing teachers from Houston area school districts on the use of the highly successful Keep America Beautiful "Waste-In-Place" curricula. These after school training seminars allow teachers to conduct the various lessons with the instructors and then put what they have learned to work in their classrooms. The curriculum is particularly useful as it is correlated to TAAS and can readily be used in the classroom. We can also help you with speakers who can come to your classroom on various environmental topics. We assist with various schools on beautification and landscaping projects in their neighborhoods and on school property. Our Graffiti Hurts program identifies targets of graffiti, and under the leadership of a professional artist, mobilizes young people to design and paint murals to cover the graffiti and enhance the area. take the Urban Runoff Challenge! Sign up your classroom and get instant access to the Urban Runoff curriculum (2 lessons), download your pledge certificate and start earning badges for each completed lesson! The Litter Free School Zone is a program for everyone from students to whole schools. It is a fun way to keep their school zone litter free. Students can work together while learning valuable community leadership and responsibility skills. They will gain a respect for the environment and world around them. The Zero and One Club challenges students to produce "zero" litter and pick up "one" piece of litter every day. The club is based on individuals making "one small step toward a litter free community." It is designed to show how one small action can have a huge impact on the environment. If a single classroom of 30 students participates in one day they will pick up 30 pieces of litter, in one month they will pick up 930 pieces of litter and in one year they will pick up 11, 160 pieces of litter! There must be a designated faculty/staff member to be the contact person. Report graffiti to appropriate school officials. At least one school event must be litter-free-such as a sports events, assemblies, field trips, etc. Report the results of these activities to Keep Houston Beautiful. Please contact our office for Certificates of Appreciation for students that participate.